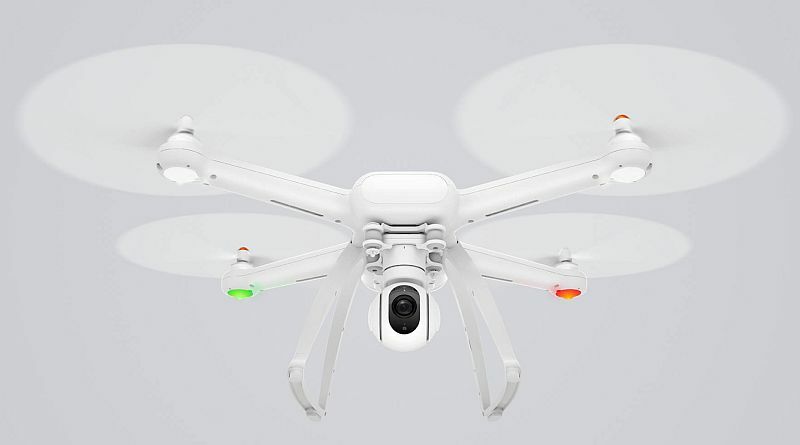 Xiaomi, as expected, on Wednesday unveiled its first drone – a quadcopter called the Mi Drone. Similar like other Mi devices, Xiaomi has worked with Flymi, a China-based company, on the development of the drone. The new Mi Drone – equipped with a camera – will be available in two variants, an affordable variant that can shoot 1080p video priced at CNY 2,499 (roughly Rs. 26,000), and one that can shoot video in 4K that has been priced slightly higher at CNY 2,999 (roughly Rs. 31,000). The company has announced that the Mi Drone (1080p version) will be crowdfunded on the Mi Home app starting Thursday, while the Mi Drone (4K version) will be available for testing via an open beta programme beginning late July. At this price point, Xiaomi’s first Mi Drone is much cheaper than some of its competitors in the drone segment such as DJI, one of the most popular drone makers. The Mi Drone packs a 4-propeller system with detachable shields and is backed by a 5100mAh battery at 17.4V which is claimed to offer 27 minutes of non-stop flying. The 1080p as well as 4K versions offer up to 104 degree wide-angle lens. The 4K camera records at 3840×2160 pixels and supports recording of stills in RAW format. Xiaomi says that the drone packs camera attached to a 3-axis gimbal which stabilises up to 2,000 vibrations per second. The device includes GPS and Glonass. The Mi Drone also comes with Autopilot option that allows it for automatic take-off and landing, waypoint flight path planning, tap to fly on map, circle an object on the ground. The device intelligently detects low battery and returns home automatically. The drone also does real-time location tracking for retrieval of the device even post-crash scenario. The company boasts that the Mi Drone can hover automatically at the edge of no-fly zones. The remote control comes with built-in PCB antenna array for maximum reach. The PCB antenna amplifies the signal of the Mi Drone and it can be controlled up to 2 kilometres. The Mi Drone sports modular design and foldable landing gear. One of the highlights of the Mi Drone is it returns back to the user automatically if disconnected from the remote. Users can trace and monitor the battery of Mi Drone from the attached phone screen of the remote. In case of low battery in Mi Drone, there is warning alarm on the phone screen. During the launch live stream, CEO and Founder Lei Jun showed how easy it is to carry the Mi Drone. The module design makes it easy to disassemble and assemble, according to Xiaomi.